HEADLINE! Heat Wave Knocks Out All City Utilities! So…whaddya DO? Just as in all preparedness plans, it is important to make your preparations before the emergency happens. Make your home ready for hot weather emergencies by applying the concepts spoken of in previous posts about Emergency Sheltering. Before the emergency, install an adequate number of attic vents to allow accumulated heat to be dispelled from your home. Additionally, have energy rated and UV protective windows installed. These measures will lower your utilities bills and help your home be cooler when the power is out. During the heat wave emergency, look for & create cool rooms. Choose rooms of the house as designated cool rooms where everyone will spend most of their time. 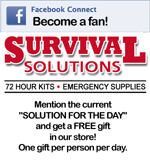 This saves on any limited resources you may have during the emergency situation. Select rooms on the lowest level of the house. Since heat rises, these will be the coolest rooms. Following this principle, sleep with your mattress directly on the floor to be cooler by a few more degrees than you would be otherwise a few feet higher on the bed frame. Select rooms with only north facing windows. This will block the heat and light from the southern sun during the day and still allow for outside cool air at night. Cover all windows, especially south and west-facing, with aluminum foil or Mylar blankets. Apply foil or Mylar directly to the windows, eliminating as much air between them as possible. This not only blocks the light and heat of the sun, but reflects it away, preventing the heating up of inside air. Keep all doors and windows closed during the day to keep out hot air, and then open upper level windows at night to let accumulated heat escape. In dry climates, in addition to foil or Mylar, promote evaporation by hanging wet blankets or sheets in front of windows and doors. As the moisture evaporates from the blankets, it creates a cooling effect. Hospitals often do this during heat waves to keep their bed-ridden patients cool. In extreme heat, sleeping in wet sheets and clothing can also help keep you cool. Unfortunately, this does not work well in areas of high humidity where the surrounding air is already saturated with moisture, hampering evaporation. Use caution when exerting yourself in these high humidity areas since sweating does not work very well either. Be sure to limit your activities during the hottest part of the day. Staying hydrated is important to help your body maintain its own cooling system. Have plenty of stored water on hand to maintain your level of hydration. If you have to cook to prepare your meals, which is a distinct possibility if the power is out and the freezer starts to defrost, cook outdoors to keep the heat out of the house. Solar ovens are a great way to conserve fuel and use to power of the sun to your advantage. Use a 3 layer clothing system to maintain a normal body temperature in cold weather conditions. The main goals are to retain heat and stay dry by dispensing and repelling moisture. The Base Layer of clothing is right next to your skin and is made from artificial fibers like polyester or nylon. Artificial fiber clothing wicks moisture away from your body, which can otherwise freeze or evaporate, both which make you colder. Cotton underwear and even cotton thermal underwear should not be used because cotton holds moisture next to your body which promotes heat loss through evaporation and conduction. The Insulation Layer of clothing needs to be breathable, like wool or fleece, allowing moisture to vent. Multiple small layers insulate by trapping non-heat conducting air between them. They also have the added benefit of being able to easily self-regulate to a comfortable temperature by adding or removing layers as necessary, rather than one bulky layer. For shelters, wool or fleece blankets work wonderfully. In a pinch, you can use dry leaves, crumpled paper, or anything else that will trap air layers all around you. The Outside Protective Layer of clothing protects against the elements such as wind, rain, snow & sun. Unless you are in an extremely wet environment, water resistant is usually better than water proof because it “breathes” better, letting moisture out. A protective layer for your shelter, like a tarp, protects you from the ground. 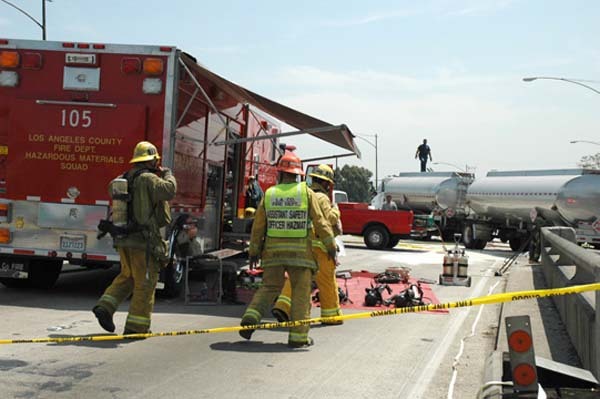 A tent also will protect you from other elemental hazards in the surrounding environment. A Mylar tent can reflect your body heat back to you in cold weather and reflect sun and heat away in hot. Any safe structures that block wind, rain or sun can save your life. An understanding of Cold Weather Clothing Layers and the Science of Effective Emergency Sheltering will help you to use your available resources to maintain body temperature and make effective, life saving shelters in an emergency. The purpose of a shelter is to help your body maintain its normal temperature. If you understand these concepts, you can use your available supplies and resources to make effective, life saving shelters for the given circumstances. always travels from warmer areas to colder areas. Conduction: Heat transfer through direct contact, such as bare feet on a cold floor. Ice packs use conduction to pull heat away from burns or sore muscles. Prevent conduction from your body in cold temperatures by wearing socks or when camping by making an insulation barrier between your sleeping area and the ground. Convection: Heat transfer through air and liquid currents. Wind chill is a good example of convection. When the wind blows, it feels colder than the ambient temperature because the moving air is pulling heat away from your body. You use convection in warmer temperatures to cool down when you use a fan. 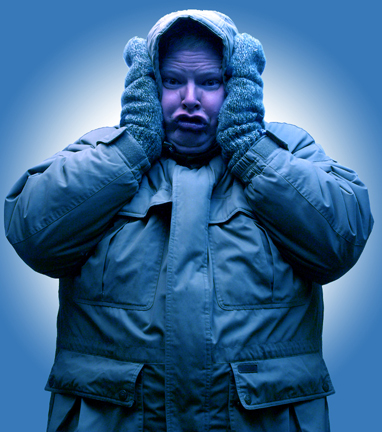 Prevent convection in colder temperatures by wearing clothing or using shelters that block wind. Radiation: Heat transfer through emission. A car’s radiator radiates heat to keep the engine from overheating. You experience radiation from the sun every day. In the same way you feel warmth from a campfire without having to touch the flame. You can even feel your own body radiating heat if you put your hand just above an area of skin. Prevent radiation heat loss in cold temperatures by using insulated clothing and shelters, and by using shelters that reflect your heat back to you. Metabolism: Converting food into energy and heat. Food is your body’s source of fuel. Help your body regulate your temperature in cold weather by eating high calorie foods like energy bars, trail mix & fruit snacks. Water is an important part in the metabolism process, be sure to stay properly hydrated in warm and cold situations. Evaporation: Heat transfer through converting liquid to gas. When your body sweats, the sweat evaporates, or changes from a liquid into a gas, which requires heat energy. This helps keep you cool. When you get out of a pool, even on a hot day, you feel cold until you dry off because of evaporation. Promote evaporation in hot temperatures by staying hydrated. In extreme situations you can even wear wet clothing. Prevent heat loss in the cold by staying dry, minimizing sweating, and by wearing artificial fiber clothing, which wicks moisture away next to your skin. In humid climates, regulating temperature through evaporation is not effective. Respiration: Heat loss through breathing. You breathe out warm, moist air. You can’t stop breathing, so in cold temperature situations, wear a mask or scarf that covers your mouth & nose. Breathe through your nose to warm & moisten the air before it gets to your lungs, and to retain as much heat and moisture when you breathe out. You could also say friction generates heat, like when you rub your hands together, but heat generation is very small and can be damaging to skin tissues in extreme situations like frost bite. After learning how your body gains or losses heat, it is important to learn how to prevent or promote those heat losses and gains. 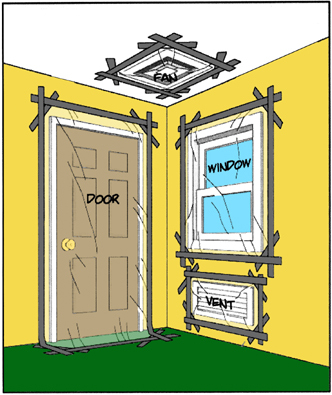 Insulation: Trapping air to stop or slow the transfer of heat. Air is not a good heat conductor, so it works well as a barrier. Multiple small layers of clothing trap air for insulation and allow you to regulate to a comfortable temperature by adding or removing layers as needed. Insulation prevents conduction and radiation. cold or reflect solar heat away from you in hot weather by using Mylar blankets, sleeping bags, or tents. Be sure to have an insulating layer of clothing or cloth between your skin & the Mylar, otherwise it turns from reflecting your heat back, to conducting your heat away. Protection: Keeping out the heat transferring elements like sun, water, wind, and physical dangers. Maintain your body temperature by protecting yourself from the elements. Stay dry and warm by wearing an outer layer that sheds water. Shelters that block wind and/or provide shade from the hot sun are also vital to survival in extreme temperatures. Moisture Wicking: Pulling water away from the body. Artificial fiber clothing or shelters like polyester, fleece, and nylon or a non-plant fiber like wool can actually wick, or pull moisture, away from your skin. This is essential in cold weather. You do not want evaporation happening or ice forming next to your skin when you are cold. DO NOT wear cotton in cold weather situations since cotton holds moisture and causes evaporation next to your skin. Having a food storage supply is essential for maintaining energy and health in an emergency situation. There is no perfect food or complete nutrition pill; nutrition comes from a variety of foods. This list is the basic food requirements for an average adult for one year. Bold items are the total for the whole category, non-bold are possible suggestions. Tailor your list based on these recommendations. Consider your needs, wants, abilities, resources and budget. Include dried or canned fruits and vegetables to add vitamins and nutrients.